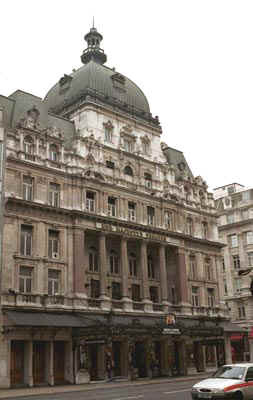 Berlioz’s relations with Her Majesty’s Theatre (which he regularly refers to as the Queen’s Theatre) were extensive and may be considered at different levels. 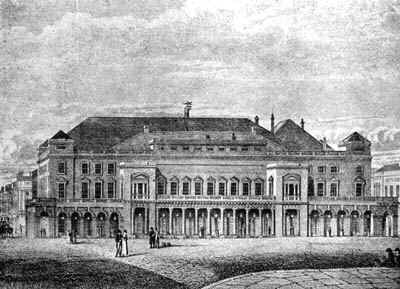 With the theatre itself, Berlioz seems initially to have hoped to get his music played there, though in the event none of his works was performed at this theatre in his lifetime. Part of the reason for this lies in his evolving relations with the theatre’s director, Benjamin Lumley, in the years from 1847 to 1853; they are examined in detailed elsewhere and will only be briefly summarised here. Before he went to London Berlioz apparently entertained the hope that Lumley would be a useful ally in London, and for this purpose he courted him in two articles in the Journal des Débats early in 1847 (24 January and 5 February). But for whatever reason Lumley was not won over; Berlioz felt aggrieved and did not pull any punches in showing his displeasure. The long term result was that when in June 1853 Benvenuto Cellini fell at Covent Garden before a hostile cabal, part of the hostility was fomented by Lumley and his followers. According to Berlioz they were motivated by a long-standing enmity between the two rival theatres, though a contributory element may have been the strained relations between Lumley and Berlioz himself. With the musicians of the theatre the story was different: Berlioz, as often, had good relations with several of them, including the violinist Adolph Ganz who played in his concert of 29 June 1848 at Hanover Square Rooms, and the horn-player Henry Jarrett who provided valuable assistance to Berlioz in his concert season in 1852. 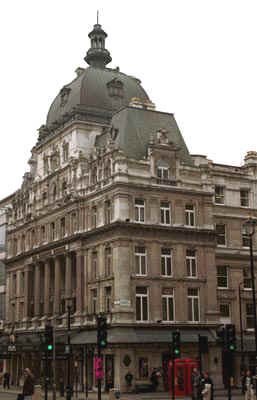 During his second stay in London in 1851 Berlioz also saw several operas performed at Her Majesty’s Theatre: Mozart’s Marriage of Figaro and Don Giovanni, Beethoven’s Fidelio and Sigismond Thalberg’s Florinda. He wrote reviews of these performances for the Journal des Débats (1 July, 29 July and 12 August 1851); part of the review of the Marriage of Figaro was reproduced the following year in the second Epilogue of the Soirées de l’Orchestre. Berlioz is especially scathing about the habit which prevailed at the time in English theatres of re-orchestrating the works of masters such Beethoven, Mozart, Weber and Rossini. In the review of the opera by Thalberg he criticised the chaotic production and ended with a barbed comment directed at Lumley himself (the passage is quoted elsewhere on this site). There are no recorded contacts of Berlioz with the theatre during his visit in 1855. 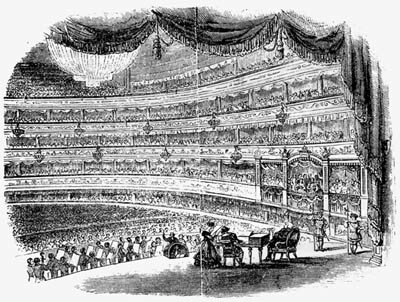 Many years later, in December 1863, Berlioz did receive an approach from Her Majesty’s Theatre for a possible staging of Les Troyens in 1864. Lumley by now had gone, and the theatre was under a new manager, James Mapleson, but the plan fell through for reasons which are examined elsewhere. This theatre, located in Haymarket, almost opposite Theatre Royal Haymarket, has been rebuilt four times since 1705. Originally named Queen’s Theatre (Queen Anne was then on the throne), it was built by Sir John Vanbrugh and opened on 9 April 1705; it largely staged Italian operas. 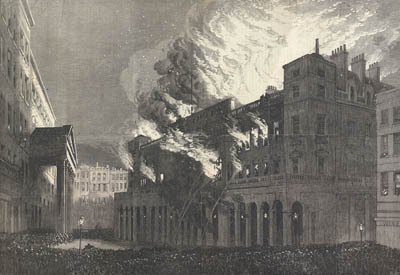 The theatre was destroyed by fire in 1789. Rebuilt by Michael Novosielski it was ready early in 1791 as the King’s Theatre; George III was on the throne by then. Further structural works, involving adding elevations to the building by John Nash were completed in 1819. It is this second theatre that Berlioz knew. In 1837 the name of the theatre was changed to Her Majesty’s Theatre, Italian Opera House, when Queen Victoria ascended to the throne. 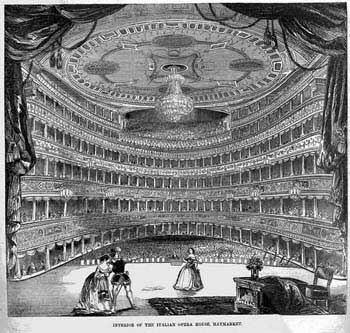 The words ‘Italian Opera House’ were subsequently dropped from the name in 1847. The Philharmonic Society had three seasons at the theatre, during which Mendelssohn, a frequent visitor to London (he came ten times between 1829 and 1847), appeared as composer, conductor and pianist. His Hebrides overture and Italian Symphony were first heard there. 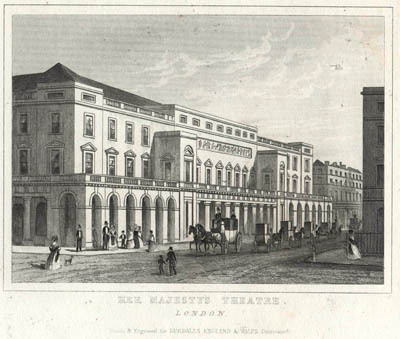 The theatre once again burnt down in 1867, and was replaced by a new one in 1869, which was demolished in 1892. The present Her Majesty’s Theatre, which is smaller than its three predecessors and was built approximately on the same site, was opened in 1897. The modern photos reproduced on this page were taken by Michel Austin in 2002; other pictures have been scanned from engravings and newspapers in our own collection. © Monir Tayeb and Michel Austin. All rights of reproduction reserved. This engraving has been scanned from the 14 December 1867 issue of the Illustrated London News.